Elegant design with intricate embroidery and hand stitched beading! The luxurious and spacious lined interior provides plenty of room for your keys, cellphone, ID, lipstick, and other essentials. Carry this charming evening bag as a clutch, grab hold of the metal top handle, or slip the chain shoulder strap over an arm when you wish to go hands-free. 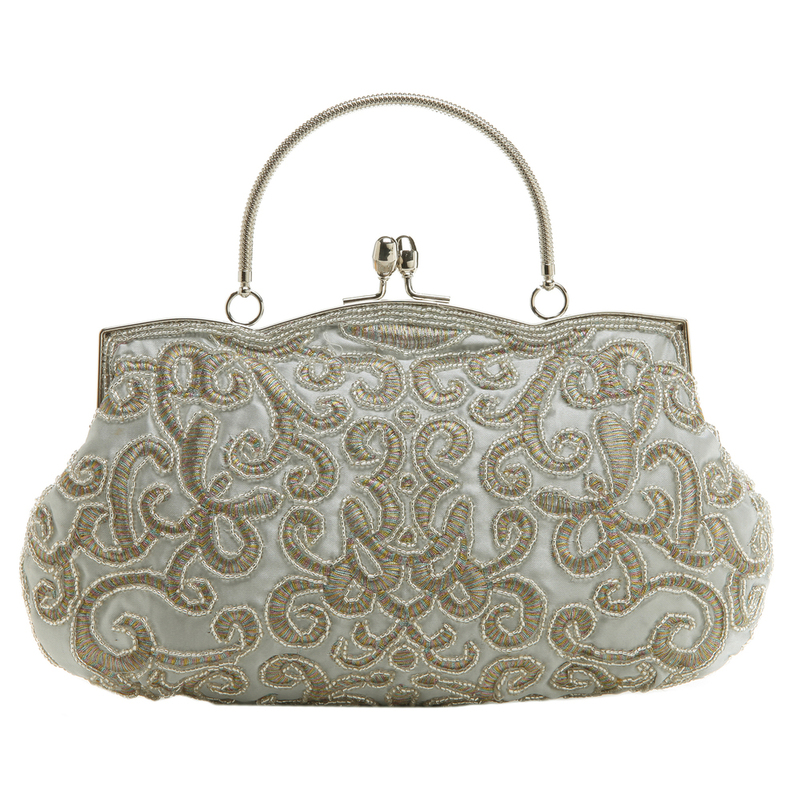 Add a touch of classic elegance and stylish beauty to your special event ensemble with this truly charming evening bag. The exterior of this beautiful evening bag is adorned with an intricate design of embroidered artistic curls and iridescent beads that will not only catch the eye, but also add that perfect dash of subtle sparkle to your special night. All the beading are hand stitched which makes this gorgeous clutch handbag unique and a sure head turner! Spacious interior is fully lined with soft and luxurious fabric. An interior pocket helps to organize your valuables. There is more than enough room to hold your cellphone, keys, ID, lipstick, and other essentials. Carry this fashionable handbag as a clutch, grab hold of the metal top handle, or slip the chain strap over an arm to wear this evening bag as a shoulder bag while you party the night away. This is simply a perfect accessory for any special occasions, from Christmas party to wedding! Or make it a thoughtful gift idea for yourself or loved ones!